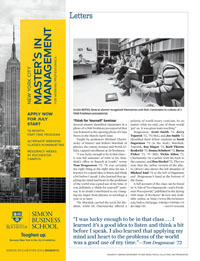 Several alumni identified classmates in a photo of a 1968 freshman preceptorial that was featured as the opening photo of Class Notes in the March-April issue. Taught by professors Michael Cherniavsky of history and Robert Marshak of physics, the course, Science and World Affairs, capped enrollment at 20 freshmen. “I was lucky enough to be in that class—it was fall semester of 1968 in Dr. Marshak’s office in Bausch & Lomb,” wrote Tom Dragosavac ’72. “It was certainly the right thing at the right time for me. I learned it’s a good idea to listen and think a bit before I speak. I also learned that applying my mind and heart to the problems of the world was a good use of my time. It was definitely a “think for yourself” seminar. It no doubt contributed to my changing my major from physics to sociology a year or so later. Dragosavac, Scott Smith ’72, Jerry Toporek ’72, ’75 (MA), and Joe Smith ’72 identified their fellow students as Scott Sugarman ’72 (at the desk), Marshak, Toporek, Ray Singer ’72, Barb Thorne Benkwitt ’72, Donna Schubert ’72, Burns Fisher ’72, ’79 (MS), Vickie Sidou ’72, Cherniavsky (in a jacket with his back to the camera), and Don Strebel ’72. The two note that the online version of the photo (above) also shows the left shoulder of Michael Saul ’72 to the left of Sugarman and Dragosavac’s hand at the bottom of the frame. 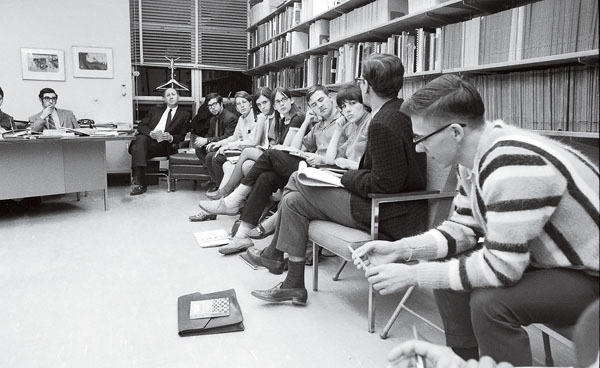 A full account of the class can be found in “A Tale of Two Superprofs—and a Freshman Preceptorial,” published in the Spring 1969 issue of Rochester Review and available online at http://www.lib.rochester.edu/index.cfm?page=3483&y=1969&v=31&i=3&p=20. Think You Had Snow Days? I noticed that the item in Rochester Review regarding classes being called off on a couple of winter days because of a deep snowfall (“Ask the Archivist,” March-April) didn’t include a reference to an event which occurred in the winter of either 1957 or 1958. We had a fairly good snowfall during the night and, after clearing the walks around our fraternity house, a couple of us wandered up onto the Eastman Quadrangle to look around. We thought it would be a fine prank if we piled some snow up against the doors of Morey Hall and then we returned to breakfast. Imagine our surprise when we learned a few minutes later that classes had been called off for the day due to the snowfall! Whether our prank had anything to do with the decision, I’ll never know—and I’m pretty sure the statute of limitations has expired on that one. I very much appreciated the article on Dean Ruth Merrill, whose quiet strength and sensitivity enriched many of us individually and campus culture collectively (“Bringing University History to Life,” March-April). We in the Class of 1960 who were privileged to have her as our dean are indebted to her for her wise counsel. We benefitted from her expression of confidence in our ability to learn and to lead. For many of us her quiet and unexpected support opened doors. Dean Merrill inspired us to add value to our lives and our society. In preparation for our 50th reunion, our class, called “City Girls,” initiated the Dean Ruth A. Merrill Award. This award recognizes a Rochester-area undergraduate woman whose endeavors enrich the lives of others. If you have an anecdote to share about Dean Merrill’s influence on your college years or would like more information on the Dean Merrill Award, contact me at anndwein@frontiernet.net.